A psalter's origins can often be 'tracked' by the saints' names given 'red-letter' treatment in its calendar, because regions and towns commemorated their local saints. 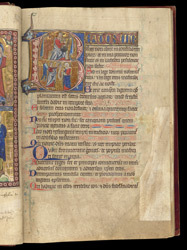 Other features of a psalter, such as types of prayers and styles or types of pictures, can connect it with a location. The Egerton Psalter, however, tells us little. Some link with Norwich is indicated by the calendar's special treatment of Felix of Dunwich, and more clues are given by another kind of evidence, later ownership. Its calendar notes deaths of members of the Holbrook and King families in the 15th and 16th centuries, as well as of William Pepyr, Vicar of Metyngham in the 14th century, supporting its early connections with East Anglia. In most medieval psalters, the first letter of Psalm 1 ("Beatus vir", "Blessed the man") is the largest and most elaborately decorated of all. In the Egerton Psalter, pictures of David composing the psalms on his harp and the Annunciation to the Virgin are painted within the letter's curves. The David portrait is conventional, but combining it with the Annunciation is one of several unusual features. The Annunciation begins a series of scenes showing the 'Childhood of Christ' distributed throughout the psalter, sometimes combining them with Old Testament scenes.